Prof. Mary Hark teaches textile design and papermaking at the University of Wisconsin-Madison. She is the proprietor of HARK! Handmade Paper, producing limited editions of high quality handmade papers in collaboration with book designers and artists. 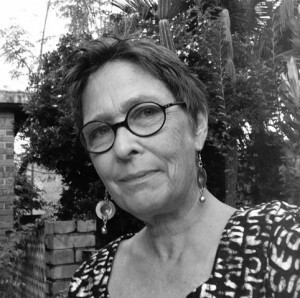 Her work is found in many museum and university collections throughout the world, including the Metropolitan Museum of Art and the Ginsberg Book Arts Collection in Johannesburg. Hark leads an initiative in Kumasi, Ghana, building the first hand papermill in West Africa that produces high-quality papers entirely from local botanicals. An artist committed to sustainable practice, Hark led a team in St. Paul MN designing and producing 2000 handmade papers, entirely from urban bio and textile waste, used as placemats for CREATE: the Community Meal public art event (Seitu Jones). Hark received an M.F.A. from the School of the Art Institute of Chicago and an M.A. from the University of Iowa in Iowa City.